GOAL FREOThe Dockers take the ball through the middle & link over the top with quick hands, the ball comes out to Sheridan & he unloads from 40 slotting through his first career goal! The ball comes inside 50 for the Cats once again, this time McPharlin & Ibbotson combine to get the Dockers out of trouble. BEHIND CATSHawkins with the long kick to the goal square, it spills from the pack & Lonergan attempts the snap from over his shoulder but misses. Freo are unable to work the ball past half forward and are yet to take a mark inside 50. Freo's defence is under some pressure in the early stages of this quarter. The second quarter is underway, Freo will be hoping for a better performance this quarter. 1/4 time: Geelong controlled possession & are smashing Freo in the contested possessions a stat that Freo generally dominate. The Cats currently lead by 20 points. BEHIND CATSFreo fail to work the ball out of defence & Stokes intercepts, he snaps from 15 out but his kick bounces to the right of the goal post. BEHIND CATSSelwood lines up 45 out directly in front but he starts the ball right & it stays right. GOAL CATSHawkins receives a free for holding against Dawsons, a bit of a soft free & Dawson gives away 50 as he questions the ump, Hawkins -from the goal square- goes BANG! Sheridan with the long ball inside 50, Walters is waiting behind but can't take the grab & none other than Taylor clears for the Cats. Clarke is off the field receiving some attention to his hammy on the boundary. Each time the Dockers work the ball inside 50 Taylor has been able to cut the ball off & deny the Dockers any scoring opportunities. The Cats lead by 2 goals & are starting to win plenty of the ball. BEHIND CATSHawkins takes the grab & lines up 35 out on a 45 degree angle, it's a poor kick off the boot it starts right & stays right. There's a bit of dew about making it difficult for both teams to cleanly take & hold possession of the ball. GOAL CATSThe ball comes inside 50, Hawkins can't control the ball & Bartel takes possession, he has a snap over his head from 20 out & drills it! Johnson receives a 50m penalty after Selwood thought the free was his and played on. Johnson sends the ball inside 50 for the Dockers the Geelong defence is too strong & they clear. BEHIND CATSThe ball comes in to the goal square, Hawkins is wrestling with McPharlin & Ballantyne is the third man up & punches it through for a rushed behind. BEHIND FREOPearce has a hurried snap from around his body but his kick is away to the right for a minor score. It's been a bit of a slow start to the match by both teams considering their ladder status. 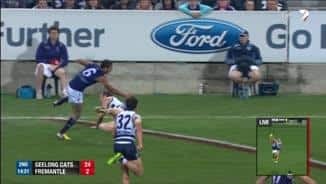 BEHIND FREOJohnson receives the handball, he unloads from 55, the kick falls short but Geelong have numbers & it is touched in the goal square & through for a behind. GOAL CATSMcPharlin drops the mark in the middle of the ground & it falls to Hawkins, he runs to 65 but has no one inside 50, he unloads with a low, floating, bouncing kick & it skids through! Christensen wins a free for a high tackle, he has the ball 45 out on a 45 degree angle, rather than going for goal square but there's no one there for Geelong & Duffield takes the grab. The siren sounds, the umpire goes BANG & we're underwayGeelong win the ball out of the middle as Selwood wins the clearance. Welcome to Simonds Stadium where the Cats host the Dockers it's sure to be a cracking match as the Cats try to turn around last week's loss against an outfit that has been impressive defensively. Welcome to Simonds Stadium for the Geelong Cats v Fremantle Round 14 clash. 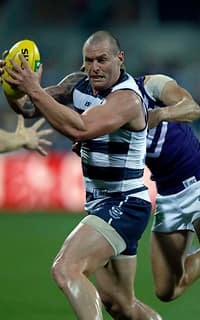 GEELONG rebounded from its embarrassing loss to the Brisbane Lions and regained a spot in the top two by scoring a 41-point victory over Fremantle at Simonds Stadium on Saturday night. The Cats were only 10 points up at the long break, but held the Dockers to just three goals in the second half while piling on 6.12, and ran out 11.19 (85) to 7.2 (44) winners. Chris Scott's men had 35 inside-50s to seven after half-time, and the margin would have been far greater if not for their inaccuracy in front of goal. 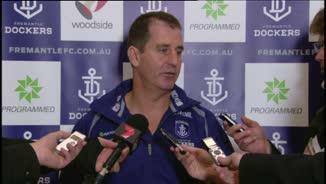 Fremantle went into the game averaging only 66 points against this season, and Ross Lyon's men attempted to reduce the game to a defensive grind. It worked initially, but Geelong took complete control in the third quarter, holding Freo scoreless and to just one inside-50. However, the Cats finished the term with a 2.10 scoreline, which meant the door was still slightly ajar at the final change. In the end, the wastefulness mattered little, as Geelong comfortably recorded its first win over the Dockers since round two, 2011. 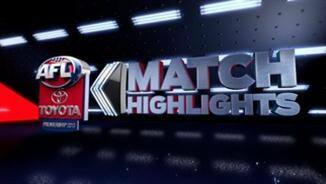 "After half-time I thought they monstered us around the ball and clearances, locked it in their front half, and that was the story of the day, really," was Lyon's summation of the contest. The victory propelled Scott's team back above Essendon and into second place on the ladder. 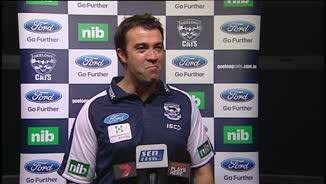 Geelong set up its victory by dominating the contested possession count 185 to 125. The Cats, who went into the game ranked last for clearances, also won that stat 40 to 33. "We thought we played the way we talked about playing," Scott explained. "It was one thing to put in the work during the week and be really clear about what we wanted from each other, but it's another thing to actually get out there an execute against a really good team. "There are some good signs there. 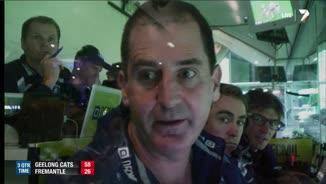 "We were embarrassed after the (loss to the Lions), and we've been questioned on the defensive side of our game. "And that stings. I'm not saying the criticism is unwarranted; in fact, I'm saying the opposite." Key defender Harry Taylor, who blanketed Dockers youngster Matt Taberner and took numerous intercept marks, was among the stars for the home side. Midfielder Jimmy Bartel was an outstanding contributor, as were fellow onballers Allen Christensen and Mitch Duncan. Taylor Hunt did an impressive tagging job on Freo dasher Stephen Hill, while Dawson Simpson and Mark Blicavs, who carried the rucking load in the absence of Trent West and Nathan Vardy, had the better of Zac Clarke. Simpson even managed to boot the first goal of his AFL career during the final quarter, his galloping run towards the big sticks drawing a huge cheer from the blue and white faithful. Big forward Tom Hawkins, who found himself constantly battling two or three Freo backmen but still managed to kick two majors, also played a key role in Geelong's triumph. Once again without veteran stars Matthew Pavlich and Aaron Sandilands, Fremantle badly missed the hardness and ball-winning ability of injured midfielders David Mundy and Michael Barlow. The Dockers were also hit hard by fresh injuries, with defender Paul Duffield subbed out of the game during the second quarter after straining his calf. Michael Johnson appeared to badly injure his knee not long after Duffield went down, but he managed to return and play out the game. Ryan Crowley, who was booed all night by the Geelong supporters (as was Hayden Ballantyne), restricted Cats skipper Joel Selwood to just 13 possessions. Fremantle, who has slipped six points behind Geelong in the battle for the top two places on the ladder, will be confident of turning its fortunes around when it takes on Lyon's former club, St Kilda, at Patersons Stadium next Sunday. Geelong will be aiming to win its 11th straight game against Hawthorn when it takes on the ladder leaders at the MCG next Saturday night.